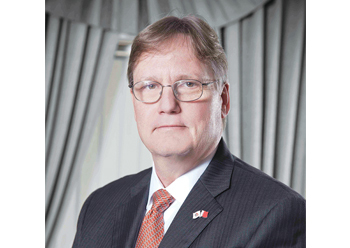 The post-BMP Bapco refinery should help Bahrain to almost double its foreign earnings through the export of larger quantities of higher value products, and will ensure the long-term sustainability of the company, thereby providing a sound foundation for realising Bahrain’s Vision 2030, says Bapco CEO Dr Peter Bartlett. 'The concept of the Bapco Modernisation Programme (BMP) is an optimum refinery configuration that places Bapco amongst the most competitive, profitable, energy efficient and environmentally compliant refineries in the world,' says Dr Bartlett in an exclusive interview with OGN. 'We expect construction of the new AB pipeline, and preparation of site works to be completed during 2018, with BMP targeted for completion by 2022,' he says. The preparation work for the BMP sites inside the refinery and to the south of the refinery were contracted to Bahraini companies Downtown and Al Hussainain respectively. In addition, over 30 engineering projects are in progress to continuously improve and upgrade the refinery facilities. For all Bapco projects, the construction phase is typically executed by local contractors, either directly awarded by Bapco or by the main contractor responsible for the project engineering, procurement and construction (EPC), he says. The technologies selected for the BMP units are all state-of-the-art proven technologies provided by internationally reputable licensors. Extensive studies of multiple residue upgrade technologies, covering the options available for a modern refinery in several different refinery configurations were carried out. Results showed that the RHCU option integrated with Bapco’s existing refinery offered the most favourable economic return on the BMP investment. The BMP has been planned so that the existing refinery continues to operate with the normal turnaround strategy right the way through to the BMP final acceptance. Tie-ins will be installed during scheduled turnarounds. After the construction of the new BMP facilities is complete and before decommissioning of the redundant existing refinery units, Bapco will have superior operational flexibility by optimising both old and new assets at the refinery. The units that are to be retired will remain available until all newly installed BMP facilities have passed start up and commissioning final acceptance tests. Referring to the complexity of the refinery post-BMP, he says the Nelson Index is a measure of the complexity of an oil refinery. Refineries that are higher on the Nelson Index are valued higher relative to their peers. Bapco refinery’s Nelson complexity increases by almost 1 as a result of the BMP, establishing the refinery amongst the leading medium-size complex refineries in the region. On the question of financing the BMP, Dr Bartlett says Bapco continues to progress its discussions on BMP financing primarily with prospective lenders. The kingdom has earned a stellar reputation in the market as a reliable investment destination, once again evidenced by nogaholding’s close last year of its substantially over-subscribed $1 billion notes under the $3 billion, 144A/Reg S, Global Medium-Term Note (GMTN) Programme, he says. What were the highlights of Bapco’s performance in 2017? Bapco’s operational and financial performance for 2017 was strong. This marks the 4th consecutive year of increasingly reliable operating performance accompanied by the benefits of good financial performance in a continuing favourable economic environment for merchant refiners. *Bapco was named a double winner of the British Safety Council Sword of Honour in Health and Safety, and also won its first Globe of Honour in Environmental Management, by demonstrating Operational and Business Excellence through the management of health and safety. Bapco is the first refinery in the region and the first company in Bahrain to win these prestigious British Safety Council awards. What contributions did Bapco make to the national economy of Bahrain during the year? Bapco is the primary generator of foreign earnings for the kingdom, via export to international markets of the refinery’s production of refined products, and the sale of crude oil (on behalf of the government) from Bahrain’s share of the offshore Abu Safah oilfield. The preparation work for the BMP sites inside the refinery and to the south of the refinery were contracted to Bahraini companies Downtown and Al Hussainain respectively. 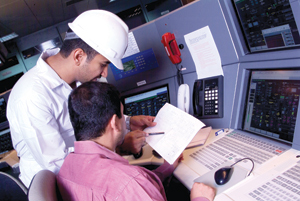 In addition, over 30 engineering projects are in progress to continuously improve and upgrade the refinery facilities. For all Bapco projects, the construction phase is typically executed by local contractors, either directly awarded by Bapco or by the main contractor responsible for the project engineering, procurement and construction (EPC). Bapco is also a leading sponsor of education, industry events held in Bahrain, and national events such as the Grand Prix and bi-annual Bahrain international Air Show, amongst others. What are the projects planned by Bapco for 2018? For all projects we follow Tender Board rules and regulations and projects are awarded after obtaining necessary Tender Board approval, which is also published on the Tender Board website. There are 13 major multi-year projects currently in progress, geared towards continuous improvement of the refinery reliability, safety, profitability and environmental footprint. For example, the foundation and tie-ins for a $26.5 million project to replace the 3 heaters of a Crude Unit with one vertical cylindrical (VC) high efficiency heater were installed during the refinery’s recent planned turnaround and inspection, and the project is planned to be completed by 2019. This investment will significantly reduce the fuel gas consumption, increase unit availability, reduce maintenance costs and improve operability and environmental performance. Having chosen the TechnipFMC-led consortium to execute the EPCC of the Bapco Modernisation Programme (BMP), when do you expect the actual work to start? What are the main objectives and scope of the BMP? The emphasis will shift towards project execution during 2018, driving the requirement for much closer collaboration between the project and operations in the core business as the pace of execution picks up. The concept of the Bapco Modernisation Programme is an optimum refinery configuration that places Bapco amongst the most competitive, profitable, energy efficient and environmentally compliant refineries in the world. The investment should help us to almost double our foreign earnings through the export of larger quantities of higher value products, and will ensure the long term sustainability of Bapco, thereby providing a sound foundation for realising Bahrain Vision 2030. What are the new units that will be added to the Bahrain Refinery as part of the BMP? What are the new technologies that we would see in operation? What are the advantages of the Ebullated Bed Residue Hydrocracking Unit (RHCU)? Extensive studies of multiple residue upgrade technologies, covering the options available for a modern refinery in several different refinery configurations were carried out. Results showed that the RHCU option integrated with Bapco’s existing refinery offered the most favorable economic return on the BMP investment. What are the targets set for the BMP’s completion? How much of it will be achieved in 2018? We expect construction of the new AB pipeline, and preparation of site works to be completed during 2018, with BMP targeted for completion by 2022. Post BMP, the refinery capacity will increase from 267,000 to 360,000 bpd. How complex will the new refinery be? The Nelson Index is a measure of the complexity of an oil refinery. Refineries that are higher on the Nelson Index are valued higher relative to their peers. Bapco refinery’s Nelson complexity increases by almost 1 as a result of the BMP, establishing the refinery amongst the leading medium size complex refineries in the region. It is learnt that BMP needs significant amounts of Hydrogen. Where do you plan to source it? Whenever a refiner upgrades heavier 'bottom of the barrel 'residues to lighter products by hydrocracking, hydrogen is required. To meet the demands of the BMP high conversion units, two new hydrogen production units will be installed with a capacity of 125 mmscfd each. What has been the outcome of your talks with export credit agencies (ECAs) to finance the BMP, a project estimated at around $4.2 billion? Has the credit ratings downgrade of the kingdom thrown a damper on the negotiations? Bapco continues to progress its discussions on BMP financing primarily with prospective lenders. The Kingdom has earned a stellar reputation in the market as a reliable investment destination, once again evidenced by nogaholding’s close last year of its substantially over-subscribed $1 billion notes under the $3 billion, 144A/Reg S, Global Medium-Term Note (GMTN) Programme. With the kingdom’s key oil revenues based on Bapco’s refining capacity and exports of refined fuels, will revenues suffer a setback when work on the BMP progresses and old units are retired? How has the lower oil price environment affected Bapco’s business? Bapco’s main income derives from its refining margin, which is the difference between what is realised in the sale of products versus input costs, mainly crude oil as feedstock. The lower crude oil price environment has stimulated global demand growth for refined products. Bapco has benefitted from the strong margins across all regions as a result of the lower feedstock costs coupled with robust sales realisations incentivised by strong underlying product demand. Are Bapco’s margins holding? How has it been for Bapco in terms of stable, reliable operations? The world economy grew faster than anticipated during 2017, on the back of an unusually well synchronised growth platform in all major regions. The International Monetary Fund (IMF) expects this strong momentum to continue into 2018 and 2019 providing some support for margin businesses like refining and marketing. Bapco continues to take maximium advantage of market opportunities by maintaining safe and reliable operations. The refinery Operational Availability (Solomon rolling average) was 96.51 per cent last year, the highest in five years. How much crude oil did you run in 2017 and how was it compared to previous years? How did your earnings perform in 2017? We profitably ran an excess of 1.6 MM bbls of crude versus plan in 2017. Bapco’s operational and financial performance for 2017 was strong. This marks the 4th consecutive year of increasingly reliable operating performance accompanied by the benefits of good financial performance in a continuing favourable economic environment for merchant refiners. How is Bapco executing the National Oil and Gas Authority’s strategies for promoting value-added industrialisation in Bahrain? A significant number of energy projects at Bapco are either in progress or in advanced stages of planning (see above), offering many opportunities for both investors and entrepreneurs. Bapco also executes a number of projects on behalf of the National Oil and Gas Authority, for example providing the engineering services for additional gas supply to Alba’s new power station that will feed the new Pot Line 6. Bapco has also taken training and development of the workforce of the future to a new level with the establishment of an Oil & Gas Academy in Awali. The facility has accreditation from the Institute of Leadership and Management (ILM) and City & Guilds, both part of the United Kingdom’s City & Guilds Group, specialised in setting the standard for professional and technical education and corporate learning and development around the world. On 3rd October 2017, the Academy welcomed its first intake of 20 rigorously selected high school graduates beginning their three-year Diploma Programme in Oil and Gas Operations. The curriculum follows recognised further education best practice and has been tailor-made to meet Bapco’s requirements.